Anyone following this blog knows that I have been writing about all the yummy tomato recipes in the Septemeber issue of Martha Stewart's Eveyday Food. Well, her peeps have noticed. Check out this post on the Everyday Food blog, giving a high-five to this site! 1.In a large saucepan or Dutch oven, heat oil over medium-high. Add onion, season with salt and pepper, and cook, stirring often, until soft, about 10 minutes. Add garlic and pinch of red-pepper flakes (if using) and cook until fragrant, 1 minute. Add tomatoes and cook, stirring often, until they begin to break down and release their liquid, 5 minutes. 2.Add 3 cups water and season with salt and pepper. Bring to a boil, then add bread and stir to combine. Reduce heat to low, cover, and simmer until bread is soft and soup thickens, about 15 minutes. Season to taste with salt and pepper. 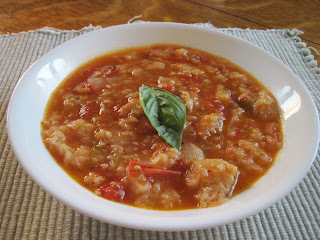 3.To serve, divide soup among serving bowls, drizzle with a little oil, and top with basil leaves. Fall is in the air, but my garden is still producing tons of tomatoes. Yes, they're cracked and gnarled, but they are still tasty. We've got so many coming off the vines right now, we can't keep up with them all! I'm planning on making a roasted cherry tomato sauce this weekend that I can freeze and enjoy when the plants truly are a memory. I figure by the end of the month, just a few stragglers will remain. With my Aunt Joan coming for lunch, I looked for a special recipe to show off my late summer tomato harvest. Again, I turned to Martha Stewart's Everyday Food. A few weeks ago I made a delicious tomato and beet salad from the September issue, which is all about tomatoes. Today I tried the cover recipe, tomato and goat cheese tart. This is extra special thanks to sauteed leeks and of course, a nice helping of fresh tomatoes. And it was really simple to make because you buy the pastry dough in the supermarket. I highly recommend this recipe to anyone who loves tomatoes. If you don't love goat cheese, you can try Feta or just go without. I used a mix of heirlooms, including chocolate stripe, green tomatoes and yellow cherries. What a great combination. Bon Appetit! 1.Preheat oven to 400 degrees. On a lightly floured work surface, roll out puff pastry to a 12-inch square; transfer to a parchment-lined baking sheet. In a small bowl, stir together sour cream and mustard and season with salt and pepper. Spread sour cream mixture evenly over pastry. Fold over 1/2-inch border on all sides and press edges to seal. Refrigerate 10 minutes. 2.Meanwhile, halve leeks lengthwise; rinse thoroughly, pat dry, and slice 1/4-inch thick. In a large skillet, melt butter over medium-high. Add leeks, season with salt and pepper, and cook, stirring frequently, until soft, 3 minutes. Reduce heat to medium and cook, stirring frequently, until leeks are very soft, 5 minutes. Arrange leeks evenly over sour cream mixture on pastry. Top with tomatoes and season with salt and pepper. Bake until pastry is golden brown and crisp, 25 minutes. Let cool slightly. Top with goat cheese and herbs before cutting into squares. Serve warm or at room temperature. This week I attended a sumptuous dinner at Manhattan's SD 26 to taste wines of Piedmont, Italy. And the conversation eventually turned to gardening. Just before I left the restaurant, a couple of fellow urban gardeners asked what crops are best to plant in the fall. So, I figured it would be a good topic to blog about. Lettuce and arugula, I can tell you from my own experience, are liking the cool weather just fine. Both crops grew like gangbusters in the spring, but flamed out in the summer heat. Now, they're prospering again. In fact, many leafy greens can handle a light frost, including Swiss Chard, kale, spinach, and collards. Most fine herbs will also grow into the fall. The basil, rosemary and oregano on my terrace are still strong and healthy. Since I grow my crops in containers, I don't go for root veggies, but radishes, turnips, carrots and beets are all considered fall-friendly if you've got enough ground space. I also hear that bok choy does well during Autumn. I may have to try it next year. Of course, this is hardly a complete list. Since I'm always interested in learning more, if you know of any good fall crops, please leave a post. NYC Community Gardens' new rules - good news or false hope? Two articles on new rules for New York's community gardens present different angles. The New York Times takes a more cautionary point of view than the Wall Street Journal. But the Times has softened its headline since the story was originally published. It had been "New rules said to threaten community gardens." It now calls reactions "mixed." What do you think? Are community gardens safer now? Summer here in the North East seems to be slipping away more quickly than I expected. Warm weather and billowy skirts have given way to cooler air and fall colors. While I contend with the onset of autumn, I find myself looking back on this year's planting season with pride and a few regrets. When we plant our garden each spring, we hope for healthy, bushy plants that grow strong and tall and produce endless amounts of ripe and delicious fruit. We look forward to the joy of the harvest with anticipation as we grow our seedlings, fertilize our young plants and then watch them get heavy with veggies. We want our garden to be a perfect specimen, free of bugs and pests, and highly productive. We want the weather to comply. It can't be too hot or too cold; there should be ample sun; and we want enough rain to aid the harvest but not to drown the crops. Of course, wanting the perfect garden is like asking for children who never get an earache or teenagers who don't rebel.The joy of gardening always comes hand in hand with the pain of its imperfections. Each year we endure aphid infestations, hornworms or powdery mildew. We deal with the disappointment of crops planted with such love and care that never grow any fruit at all (my cucumbers come to mind.) And of course, we can't control the weather. This year blistering heat scorched the lettuce, killed the blueberry bushes and stunted the basil (not to mention the impatiens.) 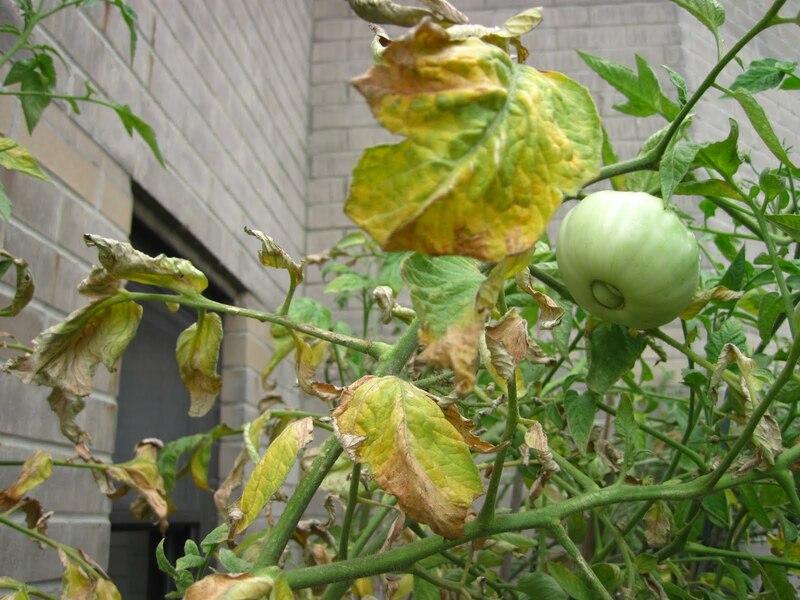 Last year, endless rain caused tomato blight in gardens and small farms across the North East. Every year, wind storms knock our pots over, crushing fruit, and the occasional heavy rain causes nearly ripe tomatoes to burst right on the vines. Yet, at the end of the day, I know we'll keep taking our chances and planting again season after season, because the joy of tasting that heirloom tomato or roasting fresh peppers and eggplant grown by hand makes it all worthwhile. What about you? Did your garden behave this summer? Would you ever give up? We decided to stay home for the big Labor Day weekend, so we could spend more time in our garden. Known as the unofficial end of summer, the Labor Day holiday makes me feel a little wistful. Already, our plants are getting withered and tired, as if they know what's coming: the fall. I spent much of this afternoon trimming dead leaves and branches off the tomato vines. Once full and bushy, now they're like ghosts of summers past, a shadow of their former selves. The Brandywine leaves are yellowing, like a tree in full fall foliage. Of course, we've still got plenty of fruit on the vines. And despite the browning bottoms, the tops of the plants are green and lively. Our eggplants and peppers also remain productive. But, there's no fooling father time. Now, I just wonder if it's better to start clipping the flowers that continue to bloom on our tomato vines to focus on the fruit at hand or to let them grow in hopes that they'll have enough time to produce more tomatoes. Anyone have any advice on that? I'm always looking for new ways to prepare our tomatoes. Yes they are delicious just as they are, with mozzarella and basil or in a tossed salad. But for variety's sake, it's nice to discover new recipes. So I was glad to see tomatoes on the cover of the September issue of Martha Stewart's Everyday Food magazine. 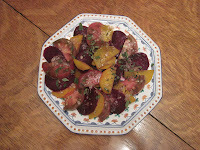 While all the recipes look good, I started with a simple Beet and Tomato Salad, as I had just bought a lovely bunch of golden beets at a farm stand on the East End of Long Island. Before trying the recipe, I purchased a bunch of fresh purple beets from the Union Square Green Market, as well. The magazine suggests roasting the beets, but I didn't want to turn the oven to 400 degrees in the summer heat, so I steamed them for about half an hour (in separate pots to make sure the golden beets didn't turn purple.) I let them cool, then peeled and sliced them, along with a couple of ripe Cherokee Purple tomatoes I had sitting on the counter. Then I laid out the beets and tomatoes on a nice platter, alternating by color and with the tomato. The real secret of the recipe is in the dressing. You dice up a small shallot and mix it with 3 teaspoons olive oil with 2 teaspoons red wine vinegar, fresh black pepper and sea salt and drizzle the mix over the platter. Top with fresh oregano leaves. The sweetness of the beets mixes with the tang of the tomato to create an incredible taste sensation. This is a great and unique summer salad that is super healthy, and easy to prepare. 1. Preheat oven to 425 degrees. Place scrubbed beets on a large piece of foil on a baking sheet. Top with 2 teaspoons olive oil and season with salt and pepper. Fold foil around beets and crimp ends to form a pocket. Roast beets on sheet until tender when pierced with a knife, 45 minutes to 1 hour. Remove beets from foil and let cool, then peel and cut into 1/4-inch-thick slices. 2. In a small bowl, whisk together 3 remaining teaspoons olive oil, shallot and 2 teaspoons red wine vinegar; season with salt and pepper. 3. On a large platter, arrange beets and 3 medium beefsteak tomatoes, sliced 1/4 inch thick, and season with salt and pepper. 4. Drizzle with dressing and sprinkle with 1 tablespoon fresh oregano leaves. Salad can be enjoyed at room temperature. Add herbs or croutons if desired just before serving. Source: September issue of Martha Stewart's Everyday Food magazine (everydayfood.com). The weathermen say Earl is coming. So, any gardener in the Northeast ought to prepare for the storm. 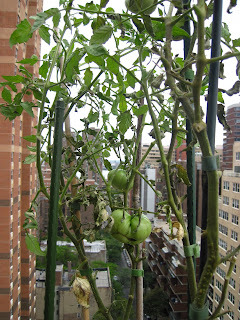 Hurricanes are no friend of urban gardens. High winds and driving rain wreak havoc on our terrace, generally knocking over plants and tossing green tomatoes around like salad. Another trick is snipping all the dead and dying stems away from the vines, so the wind will have less to catch onto. 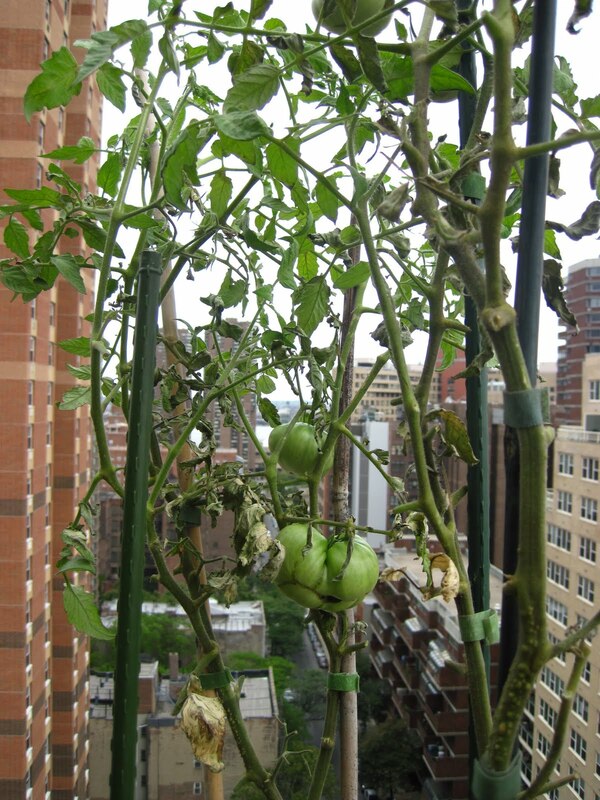 We've also roped the pots to the balcony where we could and put heavy planters around the big tomato pots in hopes that they will keep them from blowing over. Of course, this could all be much ado about nothing. Those weather casters are real fear mongers. And, the worst of it will be in Long Island, not Manhattan. Still, it can't hurt to take precautions. We've seen what the wind can do! Well, we seem to have the hornworm situation under control. I picked the last one off the yellow cherry tomato plant last Sunday and have not seen one since. However, that's not the end of the bug problems. Now, aphids are attacking my Rose of Sharon bush. I've snipped infested buds and blooms and wiped the little pests off the plant to no avail. So, I had to resort to chemicals. At first I used Safer 3 in 1 organic spray, but it had little effect. This week, I moved on to the Schultz Insect Spray, which showed quick results. Even so, aphids are pretty hard to eradicate completely. I'm still picking off the random bud covered with the tiny pests. Ugh. I only hope they die off in the winter and don't come back! On top of the bugs, I found our old nemesis - powdery mildew - on our Black Cherry tomato plant this morning! The silvery, whitish film is now evident on leaves, stems and even the tomatoes. The debilitating disease appears every year around this time, when the plants are tall, gangly and showing signs of age. Many of the branches and leaves get dry and brittle by late August and that's when the mildew moves in. It doesn't kill the plant, but it weakens it and makes it less productive. Once again I've resorted to spraying - this time with our Safer Fungicide. The spray helped get rid of the fungus and rust affecting our basil, so I hope it works on the powdery mildew. I'll let you know!